Now that you have your expertly designed logo in place, you may be considering a tagline to go with it. A tagline reinforces your brand by telling people what you do, who you are, what you’re made of, or what you stand for. But before we go any further, let’s get the tagline vs. slogan vs. motto thing out of the way. A tagline represents and stands with the brand indefinitely. A great example of a durable tagline is BMW’s “The ultimate driving machine.” A slogan is a Mad Men-era term describing a line created for a single product or for an advertising campaign, i.e. “They’re magically delicious.” A motto is a stated belief or ideal, usually by a group like “Better dead than red.” It has little to do with advertising and is probably better placed in the realm of PR. Taglines can be descriptive: “Raid kills bugs dead”; aspirational: “Never follow”; attribute driven: “A diamond is forever”; or categorical: “The way to fly.” They are almost always short. No one remembers a wordy tagline. So, on to whether you need a tagline. It’s a difficult question to answer without first evaluating what your brand is about and how much you need to introduce it or describe it to others. Have you found a niche that people will automatically gravitate toward? Is your product or service so good that word of mouth alone will drive customers to your doorstep? Does your logo speak for itself? Are you simply opening your doors and hoping for organic growth, or are you going to put any marketing or advertising behind the brand? If you plan to go the organic route, a tagline will not hurt one bit. There’s nothing wrong with informing customers of what you do and how you do it—especially if no one has ever heard of you. If at some point in the future your tagline no longer fits your brand, you can always change or drop it. 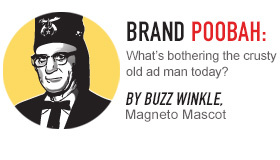 On that note, many famous brands have dropped their taglines in recent years—presumably to simplify their messaging. Most large companies have very diverse customer bases. A brand often means different things to different people, especially in different countries. Trying to talk to everyone in the same tone across the continent (let alone across the world) is a challenge. Companies find themselves using multiple taglines or using one that is so general that it means nothing. They also may be spending a lot of money reinforcing their brands through advertising and marketing. Better to just drop the tagline altogether and save the semantics and expense headaches. Using a tagline for your brand comes down to personal preference. For some it’s good vehicle to explain what the brand is about. For others it’s an extraneous, outdated vestige from an era of longer attention spans and no internet. The choice is yours. Just don’t try to convince Phil Knight that “Just Do It” didn’t influence the mindset of about a billion people.